Waverley Street, circa 1912. Distant trolley car and sidewalks, but not yet paved. The old Peninsula Hospital shortly after it was opened in 1910. (Picture taken from the Churchill Ave. side.) PAHA photo. Virginia C. Arnott, founder and first club president, in 1932 with her ten-month-old grandson, Peter Arnott, Jr. At the age of 3, Peter would help raise the flag during the 1935 dedication ceremonies. Club members circa 1935. Ginny Arnott is seated third from the left, with her husband John standing center rear. Those are likely Effie McAslen (died 1967) and Georgina Ostrander (died 1941) to the right of Ginny. Peter McKeand is standing to the right. PAHA photo. The green about 1936 looking towards where the clubhouse stands today. The old flagpole is just visible in front of the trees to the left of the figure seated center left. The original shed is behind the two bowlers to the right. Note the sloping bank behind the green. There also appears to be a roller on the green to the left. PAHA photo. Picture of the clubhouse as it appeared around 1955 with members sitting under the open front verandah. To the right can be seen the original 10 by 11 foot “shed” that served as a locker room. The building behind the clubhouse to the left is the Gamble House carriage house. The 1957 PALBC championship team of Lockhart, Rosander, Fish, and Bradshaw won the State Rink Championship in Oakland against Pasadena. 1974 Club president Paul Houseman (center), Monty Moncure (left), and Floyd Carpenter (right) look on as Gertrude Cobb prepares to bowl. The newly enlarged clubhouse is in the background. PAHA photo. Paul Houseman (left) and Floyd Carpenter display the “Meat Axe” around 1978. PAHA photo. In April 2000 the green was closed for five months for new sod (unchanged since 1935), a new drainage system, new sprinkler system, and a new walkway around the green. The outline of the original “shed” became visible when the men’s locker room was being modernized and brought up to code in 2010. Our Lawn Bowls Club shares an irregularly-shaped block off Embarcadero Road with Palo Alto’s well-known Gamble Garden. Officially Block 26, Seale Addition Number One, it was once the property of Thomas Seale, part of a 1,400 acre family farm where he raised hay for livestock. Around 1900, he sold half the block to Edwin P. Gamble (1852-1939), youngest son of James Gamble, co-founder of Procter & Gamble. The Gamble house (still standing) was built in 1902 just outside the (then) city limits, becoming the first house built south of Embarcadero other than the Seale ranch house itself (which once stood near where Webster Street now crosses California Avenue). 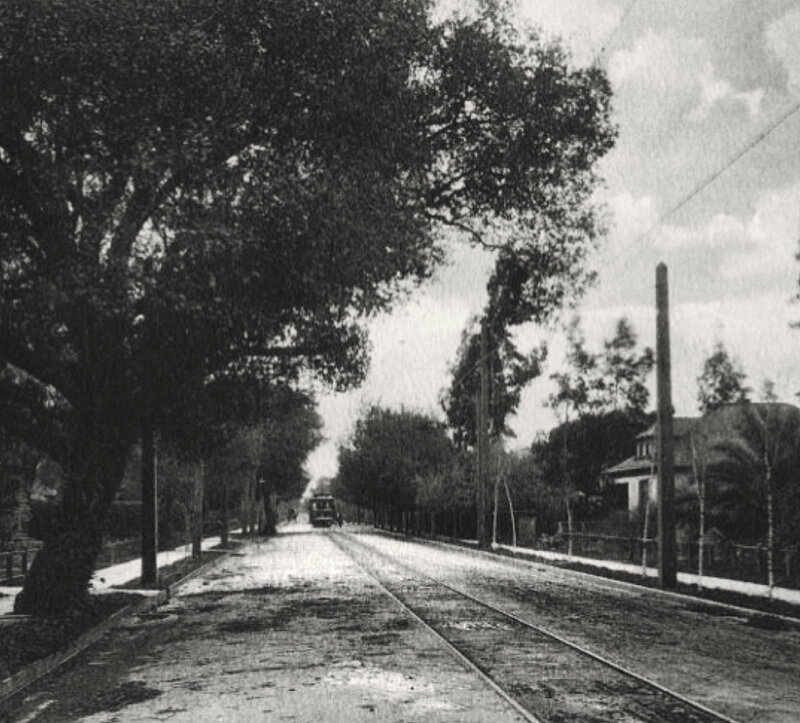 By 1906, a streetcar line was running down Waverley Street as far as Oregon Avenue. Gamble’s daughter, Elizabeth, never married and continued to live in the house until her death in 1981. The other half of the block belonged to an absentee landlady, who sold it to the city of Palo Alto in 1908 for a new hospital. 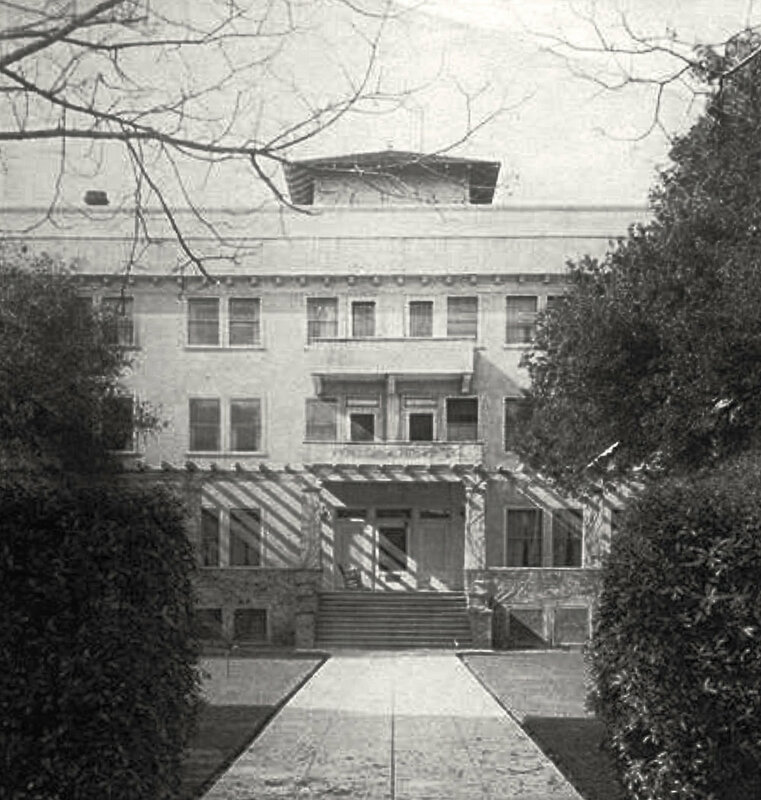 By the early 1900s, Palo Alto’s only hospital at the corner of Lytton and Cowper was proving too small, particularly with an influx of new residents after the 1906 San Francisco earthquake, and a new three-story Peninsula Hospital was constructed in 1910 on the current site of the bowling green behind the Gamble house. (The late PALBC member Glenn Stewart was born here in 1925, his mother battling Big Game traffic to make it from Redwood City for a timely delivery.) When an even larger hospital was needed, Hoover Pavilion was built in 1931 on Stanford land. The old hospital building was demolished leaving nothing but an empty, weedy lot. Mrs. John Arnott, Virginia (Ginny) Arnott (1857-1943), was the driving force behind the creation of the club and was its first president. She had learned to play the game on John McLaren’s green in San Francisco and missed it when she and her husband, a Scottish brick mason, moved to Palo Alto. The Arnotts lived on Seneca Street near the Squire House and were personal friends of McLaren. Mrs. Georgina Ostrander held the important position of corresponding secretary. A Canadian and lawyer’s widow, she came to Palo Alto in 1893 and proved to be a skilled businesswoman. She first ran a candy store and later bought half a block of University Avenue where Ostrander Hall (at 271) became a popular spot for public meetings. Her son ran a highly successful music store at 255-7 University. She eventually turned to real estate and died in 1941. 1935: Opening day for the Palo Alto Lawn Bowling Club was March 10, 1935, two years after the club’s organization. The project was funded by the Civil Works Administration, a predecessor to Franklin Roosevelt’s Depression-era WPA. The only shelter provided was later frequently referred to as “a glorified tool shed.” This modest structure measured 10 by 11 feet and was used as a locker room and improvised card room in inclement weather. It had first been proposed to locate the green in Rinconada Park where placement was “foreseen and anticipated,” but later it was decided to use the site abandoned by the old hospital instead. Program for opening day included reveille; a welcoming speech by club President Virginia Arnott; remarks by Palo Alto Mayor Earl C. Thomas and Superintendent of Golden Gate Park John McLaren; the raising of the flag by Mrs. Arnott’s grandson (on the pole still standing near the Churchill gate); the introduction of presidents from other clubs; and the playing of the Star Spangled Banner. This was followed by a ceremonial rolling of the first bowls by President Arnott, Mayor Thomas, and Superintendent McLaren. McLaren who had aided in the planning of the green was made an honorary member of the club at the time. Forty-three members had registered for the club by the end of 1936. Women apparently formed a slight majority, with men and women playing in separate leagues. The years between 1936 and 1941 have been called the “dark ages” of the club, because no records survive with information about either leadership or activity. The club clearly struggled during those years. Declining interest may have been due to a lack of balanced competition or proper equipment. Starting in1937, Mrs. Arnott’s energy was drawn to support of the Lincoln Brigade during the Spanish Civil War. Her attention to club affairs declined greatly. 1941: The club reorganized in October, with the minutes of the first meeting making reference to “the old club which had been allowed to become inactive and of little authority.” The green is reported to still be in good condition. The new club had 15 members, all of them men, a number being retired military officers. Major Leonard Smith Doten (1873-1967) became the second known president. Doten had been a major in the first World War and is buried in the Golden Gate National Cemetery in San Bruno. He was a native of Vermont with a background in engineering. His last known address was in Los Altos. 1948: The first suggestion for the construction of a clubhouse was made at a meeting of the Executive Committee held on September 6, 1948, with President John Smith presiding. Lighting for nighttime play was also proposed. A committee was formed to raise money. The clubhouse became a reality four years later due largely to the leadership of two members: Lester Matson (1878-1958) and Arthur W. Bailey (1873-1955), a retired Congregational minister. 1950: In an attempt to raise money and gain new members, the club invited the public to use the green for croquet and horseshoes as well as for bowling. 1953: PALBC incorporated on April 14: “The name of the existing unincorporated association which is being incorporated is Palo Alto Lawn Bowling Club. The name of the corporation shall be Palo Alto Lawn Bowling Club, Inc.” (signed) Club President L.E. Matson. The date of the annual meeting was changed from June to December (as now), and the first recorded inter-club tournaments were played (with Berkeley, Richmond, Oakland, and San Francisco). Annual meetings were held in local restaurants, typically Rick’s Swiss Chalet (long gone). 1954: A banner year. The clubhouse was built and dedicated on April 10, 1954, after several years of fund raising. The architect was Leslie Nichols, and the cost was about $8,000. Money for its construction came from members’ contributions, with a like amount donated by the Lucie Stern Foundation. Elizabeth Gamble also contributed generously. The structure was only a shadow of the building we know today. It consisted of a single room, with a lanai or open porch in front. The main room today contains several amateur paintings showing the original 1954 clubhouse. All show an open verandah in front (later enclosed) and the men’s locker room as an entirely separate and set-back building, the original shed. The verandah was enclosed and the kitchen added in 1974. 1957: The PALBC championship team of Lockhart, Rosander, Fish and Bradshaw won the State Rink Championship in Oakland against Pasadena. A ladies locker room with 16 lockers was built (largely through the efforts of charter member Effie McAsian who paid half the cost of building it), and a wrong-bias penalty box was installed for the first time. 1958: The first Meat Axe competition was held with the Berkeley club (with Palo Alto losing). The event was devised by then President Spencer C. Fish. The men’s locker room was enlarged to 90 lockers, with the Lucie Stern Foundation again sharing half the cost. 1962: Australia’s men’s championship team visited the Palo Alto green in May and easily defeated the home side. This was a major city-sponsored event. In an inventory taken in February of this year, the clubhouse was found to contain 44 folding chairs, ten metal card tables, five large ashtray stands, nine small ashtrays, eight decks of playing cards, six bamboo curtains, a television, and a radio. This was ten years before the club would have a proper kitchen. The bamboo curtains were mainly used to conceal the space occupied by a hot plate and a modest assortment of cups, saucers, and utensils for making tea. Also in the one-room clubhouse were a Coke machine and some sort of a “trophy case.” The club owned 12 jacks, but only three sets of bowls. 1967: PALBC, which had been in the Southwest Division, became part of the Pacific Intermountain Division effective October 1. 1968: Until the late 1960s, men were expected to wear long pants on the green and ladies to wear white skirts. This began to change in 1968 when the PALBC board discussed the matter and agreed to “try out” allowing both men and women to wear shorts on the green. WICKS, January-February 1970: “Growing pains: The Board of Directors passed the following resolution: Due to increased membership and the difficulty of completing competition for existing club trophies, the club will be unable to accept any more trophies for club tournaments, memorial or otherwise. 1970: The upright Hamilton piano was donated to the club. Although it cost the club nothing, it took $150 to move and tune. It had originally been purchased by Patrick Kearney of Menlo Park for $350 in 1923. 1972: PALBC proposes opening three “practice” rinks in the park between the green and Churchill Avenue. It was proposed that these rinks be made with an artificial surface. 1974: Largely through the efforts of then-president Paul Houseman, the clubhouse was enlarged to its current proportions by enclosing the open porch (today the Paul Houseman Room) and by adding a kitchen between the clubhouse and locker/dressing rooms, connecting the two. New carpeting was installed over the previous linoleum floor and new furniture purchased. At the same time, the dressing rooms were enlarged and the trellises erected. Costs were $30,000, a third each paid by the city, the Lucie Stern Foundation, and the membership. This expansion essentially created the building as it looks today. The city’s participation gave it ownership rights and established the lease agreement currently in effect. This lease has been renewed a number of times. Elizabeth F. Gamble died July 1, 1981, and the city assumed full ownership of her 2.31-acre property that October. 1982: PALBC proposed to the city council a plan for a second green to be built on part of the land. It would have been in the area occupied by the carriage house. An alternative plan (the blueprints still exist) was to build two greens side by side between Embarcadero Road and Churchill Avenue. The space would have encroached on the sidewalks lining both streets. 1983: The current, second, flagpole (on the Embarcadero side) was dedicated on July 4 to mark the 50th anniversary of the club. It is dedicated to the memory of Marhl Welch (1894-1982), a member and war veteran, who gave the club a new flag in 1969 and frequently led the Pledge of Allegiance. Ed Arnold became editor of WICKS, a post he filled for the next 18 years. For a number of years, the editorship tacitly was the responsibility of the club’s president. 1984: $4,316 was donated by 81 members to the memorial fund for additions to the women’s locker room. Again, it was Paul Houseman who drew up the plans and who was in charge of its construction. 1985: Men’s and Women’s Novice Singles were both added to the annual club tournament schedule increasing the number from 10 to 12. 1987: A highlight of the year was a visit from Australian bowlers. 1996: On April 28, Paul Houseman (1907-1996) dies. A native of Idaho, he had joined the club in 1959. He was a Palo Alto contractor and was responsible for the kitchen addition as well as clubhouse lighting and other improvements. 2000: In April the green was closed for five months for new sod (unchanged since 1935), a new drainage system, new sprinkler system, and a new walkway around the green. A drinking fountain was installed by the gate. Frank Souza, who has belonged to a number of clubs through the years including Palo Alto, is elected to the USLBA Hall of Fame. He was a member of the U.S. National Team from 1976 to 2000, whereupon he became team manager. 2001: In April, a no smoking ban was put into effect. 2002: The “Good Guy” award was established by Terry Hogan and presented to Ed Arnold the first year. Arnold edited WICKS from 1983 to 2001. 2004: Draw Mixed Rinks was abandoned as a club tournament after six straight years of cancellation. Senior Singles replaced it to keep the number of championship titles at twelve. Also new champion boards were installed in the clubhouse to display the names of all tournament winners since 1975. They were the contribution of member Tony Mayta, a skilled cabinetmaker, and should serve the club until 2034. 2008: The Palo Alto Lawn Bowls Club celebrated its 75th anniversary. A new sign was erected on the Churchill side and the older sign was moved to join its twin on the Embarcadero side. 2009: The club, under Terry Hogan’s guidance, hosted lawn bowling as a demonstration sport at the national Senior Games (senior Olympics) in August when thousands of athletes descended on Palo Alto. A barbecue bought from 75th anniversary funds was stolen when the clubhouse was fumigated. Dorothy Beckett, the club’s oldest member, dies at age 104. 2010: Both bathrooms were completely remodeled by the city and brought up to code. New lockers were built and installed by Bud Birkenseer and Sam Hebert. The club also added a new water heater, a new furnace, and new gutters. The club purchased new tables for the clubhouse and a storage shed which was installed on the Embarcadero side of the clubhouse. 2011: WCKS, under editor David Hale, became available by email. 2012: The “United States Lawn Bowls Association” (USLBA) changes its name to “BowlsUSA.” WiFi becomes available after the club makes several electrical upgrades toward the end of the year. 2013: PIMD president Greg Fyvie deposits a large library of books on lawn bowling with the club for the use of members. The collection was later cataloged by Peter Danner. 2014: The club purchased a flat-screen television and hung it where tournament boards had previously hung against the back wall. These boards were then placed together with the older ones across the room. 2015: David Hale designed and constructed a new draw game board. 2016: The grassy lawn to the left of the clubhouse was paved over and transformed into a patio area. With the help of Kent Mather, Larry Guglielmelli, and Hank Heubach and the local Kiwanis club, a new gate was installed at the Embarcadero entrance, one that matches the gate on the Churchill side. NB. Much of the above information survives only because of the foresight of several past Club Historians. Thanks must be given to Bert Firminger 1959-1966, Colonel Billy White 1966-1976 (died 1984), Tony Hock 1976-1980, and Ed Arnold 1983-2001. Due to the club’s demographics, much of their job, unfortunately, involved collecting obituaries. All Name Trophies were retired after 1974 in accordance with an action taken by the Board of Directors in the spring of 1975. All tournament winners from 1975 onwards, have individual name tags on the championship boards created for this purpose.